Are All-on-4 Tooth Implants a Permanent Option? New York City residents who are missing all of their teeth, or whose teeth cannot be salvaged and must be removed, are often looking for a permanent tooth replacement option. Unlike dentures, which are removable and can shift when you chew and speak, All-on-4 tooth implants are a permanent solution for New York City residents seeking a full mouth restoration. But what exactly are All-on-4 tooth implants, and where can you get them in New York City? Read on as Manhattan’s top periodontist Dr. Kissel explains. Tooth implants are permanent, replacement teeth. First, a titanium rod, which mimics the natural tooth root, is placed into the jawbone to anchor the implant. By placing this rod into the jawbone, tooth implants stimulate jawbone growth, which means you eliminate your risk of eroding your jawbone and receding your gums, which are common occurrences when you replace your teeth with dentures. After the titanium rod is installed into your jawbone, a tooth-looking crown is placed on top, providing you with a natural looking smile and complete oral function. Unlike dentures, you can chew and speak without the risk of your tooth implant falling out or sliding, and you’ll never need to remove your tooth implant. How Do All-on-4 Tooth Implants differ from Regular Tooth Implants? All-on-4 tooth implants are a special implementation of tooth implants to restore a full smile. With All-on-4 tooth implants, 4 titanium rods are placed into your upper jawbone, and 4 are placed into your lower jawbone. On the top of the mouth, the outer two rods are longer and placed slanted, to avoid your sinuses. On the bottom of your mouth, the outer two rods are longer and also titled to avoid the nerve in your bottom mouth. But whether slanted or straight, All-on-4 tooth implants support not just one tooth, but a full arch of replacement teeth. This means that you can have all 28 of your natural teeth permanently replaced with just 4 supporting tooth implants per jaw – a much more affordable and much less invasive procedure than having one implant for every tooth. And, since All-on-4 tooth implants are permanent, you’ll never have to worry about the complications and shortcomings of removable dentures. Can I Have My Mouth Fully Restored with All-on-4 Tooth Implants in a Single Day? To determine if you a good candidate for All-on-4 treatment in New York City, you will first undergo a dental CT scan. If it’s determined that you are a good candidate for All-on-4 tooth implants, your 28 tooth crowns will be created using digital planning software. Since your tooth crowns are pre-created, this means that in one day, you can hit the streets of New York City with a fully restored mouth. Where Can I Get All-on-4 Tooth Implants in New York City? All-on-4 tooth implants are a specialized treatment option, and not every periodontist or oral surgeon in New York City offers them. However, Manhattan’s own Dr. Kissel does offer same day All-on-4 tooth implants, enabling New York City residents to come into his office in the morning with missing teeth and walk out in the late afternoon with a brand new smile. If you would like to find out if you are a candidate for All-on-4, we highly recommend that you contact Dr. Kissel for a consultation and oral examination today by calling (212) 702-9088. 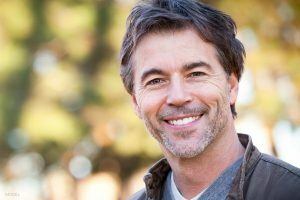 « What Happens After a Tooth Implant Placement?